A hide-and-seek, fun-filled caper full of fairytale characters with a magical twist at the end! 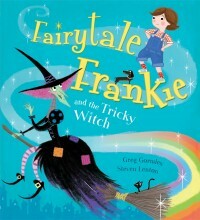 Fairytale Frankie is a fearless tomboy who wakes up one morning to find a princess hiding under her bed and a frog in the cornflakes . . . all the characters appear to be hiding from a baddie and Frankie is determined to keep them safe. This funny, fast-paced story is a visual feast – a real treat from one of the most exciting contemporary artists working today. Superbly imaginative and wonderfully illustrated with joy and verve. The story whisks the reader through the pages to a very satisfying conclusion.